Those looking for a 42" plasma with a full HD resolution aren't exactly spoilt for choice at the moment. 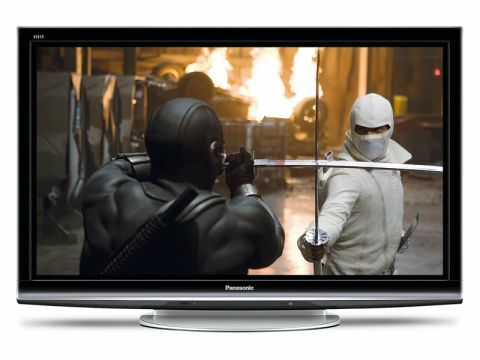 However, the TX-P42G15 from Panasonic shows that there's plenty of life in gas yet, as alongside that all important full HD support, it also manages to pack in plenty of useful extras including a Freesat HD tuner, Viera Cast internet connectivity and an SD card for viewing photo and video files. Panasonic has thrown everything at this TV, with the result that its one of the most feature-packed sets in its current lineup. For starters, the panel is one of the new NeoPDP types and is driven by Panasonic's highly regarded V-Real Pro 4 processing engine so it promises deeper blacks, smoother motion control, more light output and faster response times (there's even a Game preset that's tweaked for fast refresh rates when used with the Xbox 360 and PS3). Straight from the box your choice of available channels is pretty comprehensive as the TV has both Freeview and Freesat tuners onboard, the latter of which means you can watch ITV and BBC HD broadcasts for free when you hook it up to a suitable satellite dish. And unlike Panasonic's lower-end G10 models, this set sports both Viera Tools and Viera Cast. The former provides a series of widgets that you can use to view photos and videos either from SD cards or across a home network from a PC. Viera Cast, on the other hand, gives you access to internet services such as Eurosport, Picasa and Youtube that have been specially tailored for the telly. The YouTube service is one that's most worth having because, not only is it easy to use, but it also manages to make videos looking surprisingly good on the large screen. Like the remotes on Panasonic's other recent TVs, the one for the TX-P42G15 is long and slim so it fits comfortably in your hand. Plenty of thought has gone into the layout, too, so all the most commonly used functions are within easy reach. The set's menu structure is also very logical and easy to follow, so setting up the TV and tweaking picture and sound settings is relatively painless. Design-wise the EPGs for the Freeview and Freesat services look a bit uninspired and certainly aren't up to the level of the latest Sky HD EPG. Nevertheless, they're fast, functional and easy to find your way around, so we can't complain about them too much. Panasonic's big boast for its NeoPDP technology is that these panels are much brighter than previous generations. That's certainly the case here and is especially noticeable on the telly's Dynamic setting where it looks almost as bright as some of the latest LCD TVs. Thankfully, this extra brightness isn't achieved at the expense of black levels, because deep space scenes in sci-fi's such as Serenity on Blu-ray retain the inky blackness of space without losing the distant shimmer of the background blanket of stars. But the set also delivers stunning rich colour right across the spectrum so every thing from sports to soaps look impressive. That said, the standard picture presets don't really show the set off at its best, so it's worth doing a bit of tweaking to get the most from it. Naturally the TV really shines when handling hi-def pictures from Blu-ray or channels such as BBC HD, but it also does a good job of upscaling standard-definition programmes from both the Freesat or Freeview tuners. And while Panasonic's TVs have been a bit hit and miss, when it comes to fluidity of motion the company is back on track with the TX-P42G15. The 600Hz system used here really does make even the fastest tracking shots look remarkably crisp and suffer little, if any, discernible judder. The TX-P42G15 is pretty slim by 42" standards, so you wouldn't expect much from the speakers, but Panasonic has actually managed to do a decent job here. The bass is not exactly going to have the neighbours banging on the walls to get you to turn it down, but it does have enough punch to do justice to action movies, while the tight midrange and sparkling treble gives plenty of definition to dialogue in movies or just regular TV shows. As you would expect, Panasonic charges a premium for the luxury of a 1080p plasma panel, but in the case of the TX-P42G15 it's certainly worth it as the pictures either from Blu-ray or BBC HD via the onboard Freesat tuner are simply stunning. Add in the impressive standard-definition performance, plus the useful Viera Tools and Viera Cast features and you've got an excellent high-end set that really delivers.